Logitech's latest wireless mouse - will it convince gamers? Logitech has taken a bold step by releasing a wireless gaming mouse, but there remain huge doubts from professional gamers that even the most advanced technology is reliable enough. Microsoft has already trialled wireless gaming mice through its Sidewinder range, and Logitech's latest G700 will be considered a desirable piece of gaming kit by many. But for the top echelons of gamers, and the much bigger group of serious gamers that care greatly about their kit, wireless still brings major doubts. "Wireless peripherals have come on a long way in recent years and some of the better ones out there are actually really great," said pro gaming events organiser Corin Cole. "The reason they're not suited for professional gamers, however, is that they just aren't as reliable as wired mice. "If I'm browsing the web at home and run out of battery, or find there's some interference causing me problems, that's fine, I can live with that. "If it happens to a gamer in the middle of a big game when prize money is on the line, that becomes a huge problem, and that's not a risk they want to take." Cole's take is reflected by many gamers, myself included. I have dabbled with wireless mice, but a series of horror stories involving death, destruction (only of my avatar fortunately) and severe gamer rage put pay to that brief foray. 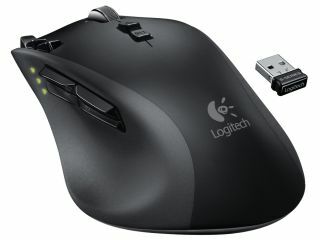 Logitech's wired mice are, as thousands would testify, wonderful pieces of technology. I currently use a G9 at work and G9X for my main gaming PC – but despite my faith in the company's peripherals I won't be taking the jump to wireless. Firstly, I don't really see the point. At no point in my gaming life have I felt trapped by my wired mouse. A wireless headset is a slightly different matter, but when you sit in front of a screen (or a laptop) the chance of ever being irritated by the wire is tiny. So when you factor in problems like charge and interference – however unlikely – you can understand why people are reticent to leave their cables behind. The latest Logitech mouse, and Microsoft's wireless Sidewinder, offered the chance to leave the cable plugged in, giving people the option of choosing wired or not. But, several of my problems came from the mouse constantly failing to charge despite being 'plugged in' so even a wired/wireless mouse can have issues. I'm not convinced by a wireless gaming mouse. Wireless makes a degree of sense for casual use, but I just haven't been given a proper reason why I need to do away with my trusty old wired version.